On this day, 10 June 1854, there was an outbreak of cholera in Grenada following a soldier being seized with the disease, dying the next day. 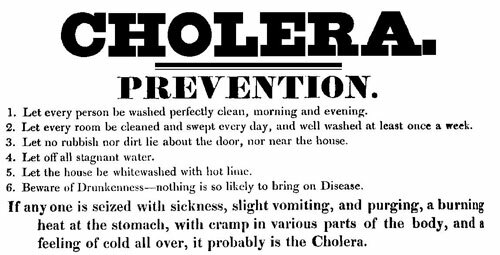 Cholera had been detected in the Caribbean for a number of years, but between 1850 and 1856 it ravaged the islands of the Caribbean. In 1854 it reached epidemic proportions in Grenada and resulted in the deaths of at least 3,735 people; another report places the number at 3,788. It is an acute bacterial infection of the small intestines resulting in severe diarrhoea, with rapid loss of body fluids and salts, and can lead to death. On Saturday 10 June, cases of Asiatic cholera were detected among soldiers garrisoned at Fort George. Local health officials believed the disease was caused by “extremely unsanitary” conditions at the fort as well as a lack of air circulation. In an attempt to stem the spread of the disease, the remaining troops were “removed to an airier place” at Richmond Hill, but it was not prompt enough to contain it. The men of the Artillery and the 69th Regiment of Foot, which had recently arrived from Trinidad, were devastated by the disease. The disease proved deadly because of the unsanitary conditions prevailing in the town of St George. As the days went by the number of fatalities increased. With the lack of adequate medical services, the disease spread unimpeded throughout the island and to the Grenadines, exacting a heavy toll. A major effort to contain the disease failed due to the shortage of medical supplies and personnel, some of whom were requested from neighbouring islands. The military barracks under Fort George (later the GeneralHospital) was temporarily converted to a quarantine facility in an attempt to contain the disease. From June to September cholera raged throughout the islands, ravaging the population and killing at least 11 percent, many from St Patrick (1,363) and St George (682). The cholera epidemic struck many islands in the West Indies leaving 20,000 dead in Barbados and 30,000 in Jamaica. It prompted the Grenada government to pass legislation providing each parish with medical personnel and to improve sanitary conditions in the towns.